, an eminent scholar, and illustrious lawyer of Italy, was born of genteel parents at Roggiano, February 18, 1664; and educated under Gregory Caloprese, a famous philosopher of that time, and his cousin-german. 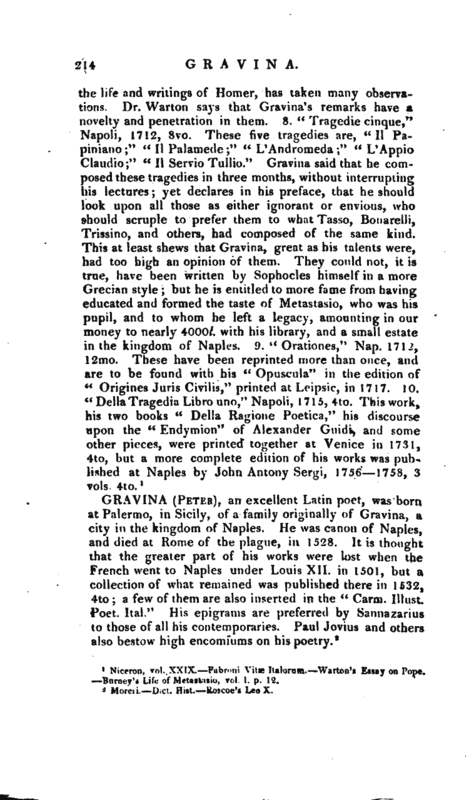 He went to Naples at sixteen, and there applied himself to the Latin and Greek languages, and to civil law; which application, however, did not make him neglect to cultivate, with the utmost exactness, his own native tongue. He was so fond of stu<jy, that he pursued it ten or twelve hours a day, to the very last years of his life; and, when his friends remonstrated agakist this unnecessary labour, he used to tell them that he knew of nothing which could afford him more pleasure. 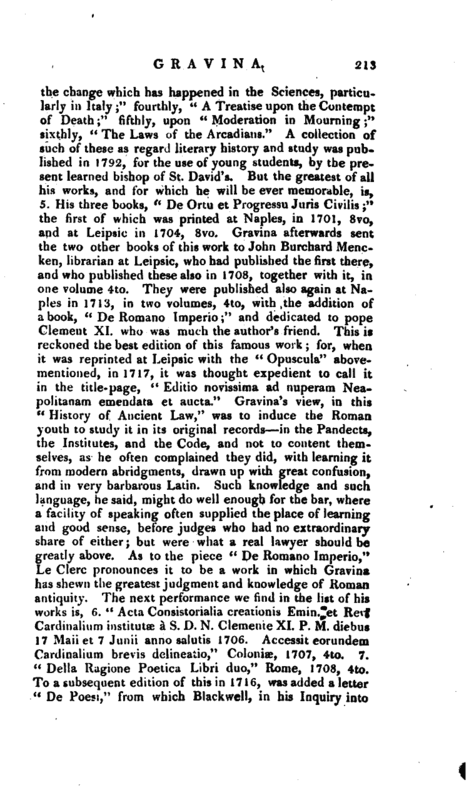 He went to Rome in 1689, and some years after was made professor | of canon law, in the college of Sapieozia, by Innocent XL who esteemed him much; which employment he held as long as he lived. He does not, however, seem to have been of an amiable cast; at least he had not the art of making himself beloved. The free manner in which he spoke of all mankind, and the contempt with which he treated the greatest part of the learned, raised him up many enemies; and among others the famous Settano, who has made him the subject of some of his satires. It is said that he missed a cardinal’s hat because of his satirical turn of mind. When at Rome he used to bow to coach-horses, “because,” said he, “were it not for these poor beasts, these great people would have men, and even philosophers, to draw their coaches.” There were at one time doubts of his religious principles, and his pupil Metastasio seems inclined to justify these, by sinking this part of his history. 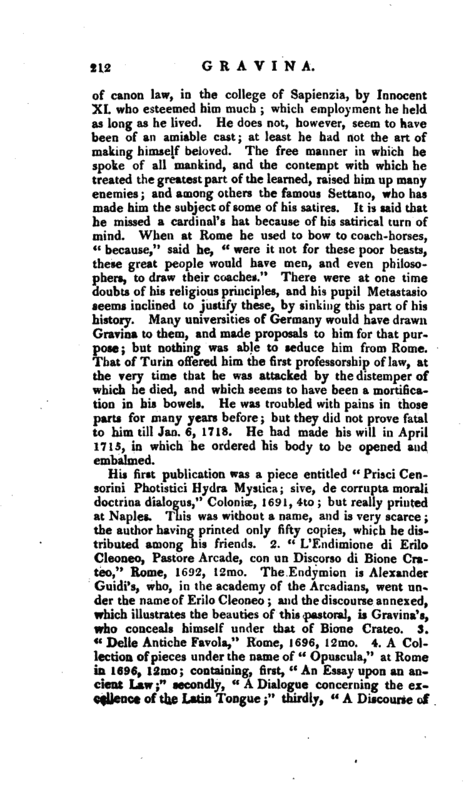 Many universities of Germany would have drawn Gravina to them, and made proposals to him for that purpose; but nothing was able to seduce him from Rome. That of Turin offered him the first professorship of law, at the very time that he was attacked by the distemper of which he died, and which seems to have been a mortification in his bowels. He was troubled with pains in those parts for many years before; but they did not prove fatal to him till Jan. 6, 1718. He had made his will in April 1715, in which he ordered his body to be opened and embalmed. Niceron, vol. XXIX. —Fabroni Vitae Italorum. 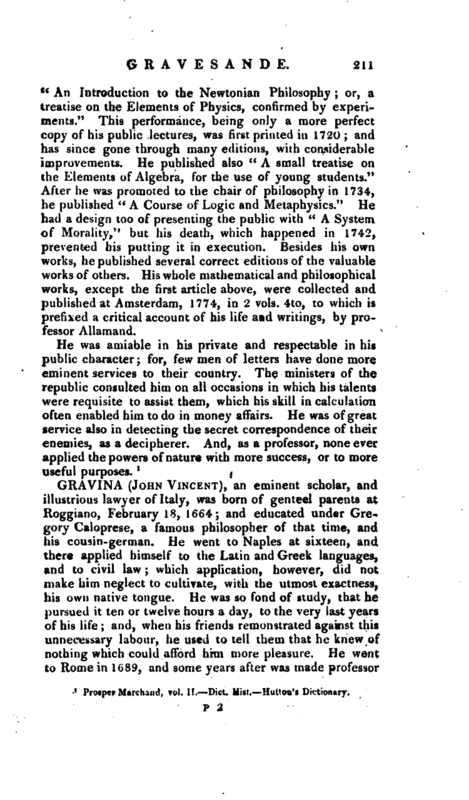 Warton’s Essay on PoneBurney’l Life of Metastasio, vol. 1. p. 12.